Doesn’t she look so proud of herself holding a toy? This is a summary for Brinley’s 15th week; she was 14 weeks old. Brinley got MUCH faster at eating this week. She also got much more annoyed if I tried to get her to eat longer than she wanted to. It is very hard to go from a baby who eats for 20 minutes per side to your baby refusing to eat longer than 10 minutes per side. I knew it was coming, though. I distinctly remember it happening to every one of my other children at 3 months old and I have told many of you that it is “totally normal.” I know it is normal. And still it is hard for me to fully accept initially. I believe her now, though, when she is done. It is a great thing for your baby to be able to communicate done (you know, by scowling, arching her back away from you, and skwacking when you try to make her eat–how to you spell scwacking? I cannot remember right now. Oh! Squaking? Squawking! There I remembered. I think my brain will fully return to me someday.). There is something I do when feeding her that makes her eat more contently. I had to do this with at least Brayden–maybe McKenna too. I can’t remember for sure. Kaitlyn was just a speedy gal so I barely had time to sit down, but I needed this with Brayden for sure. I have to hold the hand that is up while nursing. So when I am nursing her on my right side, I hold her right hand with my left hand. She is much more content to eat when I do that for some reason. A great thing about the baby getting faster at eating at this age is the baby is also starting to really play at this age. Then you have more play time. Cuddle time while eating is fun, but I really enjoy playing and watching babies learn. They are so smart and such fast learners. This week I remembered that I give my kids toys at three months old, so I gave her a toy. She was very excited about this. She isn’t capable of just reaching out and grabbing them yet. She can reach out and fist-bump toys and bat toys, but she isn’t grabbing. She can take hold if I put it right at her hand and she holds on for dear life. 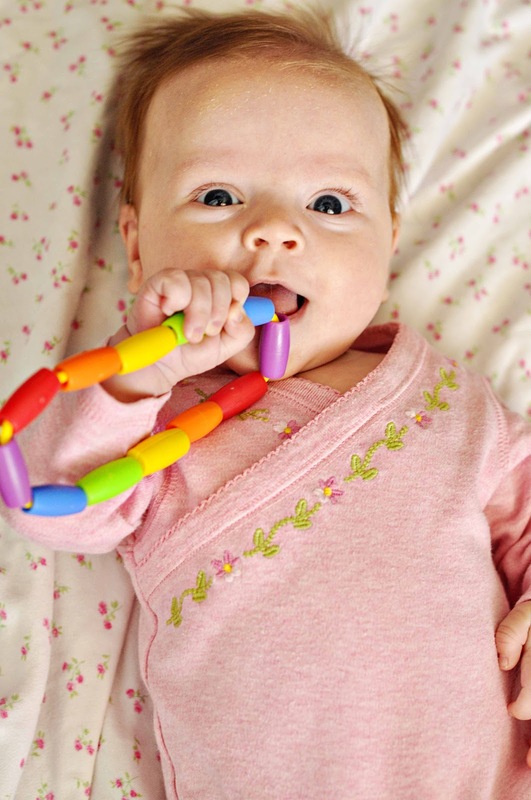 When choosing a first toy for your baby, keep it skinny and light. Don’t do like I did for Brayden. I did a rather heavy rattle (heavy for a baby) and he totally smacked himself in the head with it. I tried the one-arm swaddle again this week. She was not having it. I did it for the first nap of the day so I would know for sure if it was the swaddle or just evening fussiness. It was the swaddle. I watched her on the monitor and her free arm was just flailing all over the place. After about 10 minutes, I went in. She looked distressed! I put her arm in the swaddle and she cooed at me and looked relieved. It was really like she was thanking me. She then went right to sleep. So she isn’t ready. That doesn’t mean your baby won’t be at this age–many babies this age have been sleeping swaddle-free for a month. She just isn’t ready for it. If your baby isn’t ready for it either, don’t stress about it. Your baby will not be “addicted” to the swaddle. Don’t stress. Here is my problem. I always hang on to the dreamfeed up until the baby really needs either the dreamfeed dropped or the four hour schedule One day, I totally lost track of time and she ended up on a four hour schedule that day. She then slept through the night as normal. So it further points me to her being about ready to drop the dreamfeed. However, it isn’t hurting anyone and I like it. And I want to keep it until she is four months old. And I don’t want a four hour schedule yet all day because she can’t have a long enough waketime for her to be up enough in the day. Oh yes. Here it comes. The worst wonder week of them all. Wonder Week “19,” which I put in quotes because really, it lasts from about 14 weeks until 19-22 weeks. Really? Okay, so in my experience, it isn’t just solid 5 weeks of fussiness and poor sleeping. You might have off naps, off days, or an off run of days, but hopefully not a solid five weeks of it. Brinley had several days of shorter naps. Where I often am waking her for feedings at 3-4 hour intervals, she was waking at 2.5 hour intervals. My policy is to just feed her if she wakes earlier than normal in case of a growth spurt. But then she wasn’t eating because she just wasn’t hungry at those times. So by day three I decided to try my old swing trick I used with Kaitlyn. Since Kaitlyn had reflux, I never knew if she was waking early because of reflux issues or hunger. So I would put her in the swing if she woke early. If she fell asleep, I let her stay and sleep. If she didn’t fall asleep after 10 minutes, I fed her. I did this with Brinley and she fell asleep every time. So she was having a rough time with a sleep transition. I am so glad she will sleep in a swing. McKenna did not. So if you find your baby is waking early and not hungry during this age range, try a swing, rocking back to sleep, sleeping in a baby carrier…something to help baby. Don’t worry about swing dependence. Kaitlyn spent a lot of time sleeping in a swing and she is a great sleeper today. After her day of finishing naps in the swing she went back to normal the next day. I am telling you, this wonder “week” can be very disruptive. Just don’t freak out about the short naps that are likely to come along during this time. Hi Val! My name is Shea, and from what I can tell we have baby girls that are just a few weeks apart- she is my 3rd- and turned 16 weeks old 2 days ago. She was doing so very well, very predictable- needing to be woken up for the next feed, happy and content, sleeping 12 hours- for about 3 full weeks. Then she got a little sick, and we had sender backs on sleep with the cold- but things have just erupted since we got her good and well. She wakes randomly at night. Her naps are all over the place! She was getting about 18 total hours of sleep in a 24 hr period- not being able to handle more than 50 min of waketime. This has all significantly changed. She is cranky, she never wakes happy anymore, cries when being put to sleep, and can't take a nap longer than 1 hr. I've tried increasing/decreasing wt lengths. She also hates to eat- never ever hungry at the 3.5 hr mark and usually not even at 4 hours. It's been near impossible to get all 5 feedings in. What do you think I should try? She literally is her most upset during feeding times 🙁 thanks for posting Brinleys summaries- they are such a help! I think my daughter started Wonder Week 19 a week early. It started with the time change, then a cold, then growth spurt, then a virus…all those things mixed together made for a crazy baby. It has been insane. She was starting to sleep 5-6 hours a night (which was good for us, she has reflux so she has a tough time sleeping through the night), but as soon as all of that hit, she was waking every 2-3 hours at night. It's starting to get back to normal, but my goodness! Also, I totally do that thing where I hold her hand while she eats, it seems to help her focus! Hi Val,I have a question that I'm hoping you can shed some light on: How can I drop a middle-of-the-night feeding? My 10-week-old is on a 2.5 hour schedule during the day, but reverts to a 2-hour schedule at night. He'll eat ok (often will just take one breast) when he wakes, and he wakes at different times overnght, but one the few times that I have the patience and courage to not feed him, but to put him back to sleep he actually sleeps a whole 4 or 5 hours. That means he's not really hungry, rigth? If so, do I just keep not feeding him when he wakes? He's very healthy and feeds very well during the day, so he shouldn't be hungry that often at night, right? ?Thanks a million!! Hi! I was hoping you could share your thoughts on what is going on with my daughter! She is now 13 weeks old and for several days she has been VERY fussy, which is unlike her. She cries when she gets up. She won't play for long without crying. Her naps are terrible. She even cries when I hold her and look at her. She cries when her daddy talks to her. She is all the sudden super sensitive to a sudden noise and will start screaming. She was born on her due date, so according to Wonder Weeks, shouldn't I be in between these crazy phases. Is it a delayed Wonder Week 12 or an early Wonder Week 19? I don't know what to do with her. She won't nap and gets very tired as the day wears on. I'm ready for this to be over! Any experience with this at this time with any of yours? I am having the same issue as the previous person with my 12 week old. It has been going on since her 3 month growth spurt which she hit at 10 weeks (she will be 3 months when she is 13 weeks old but has hit all of her growth sports early so I wasn't surprised). Her naps are 45 minutes and sometimes I can get her back to sleep with her paci but I'm having to revert to the swing a lot. Glad to know you've done it too and your daughter didn't become swing dependent. I was worried about that! My question is the same, is this part of wonder week 12 or an early wonder week 19? So like one of your other readers, my 15-week old (will be 4 months december 27th) has reflux (which I think is under control), and was so sick 1-1/2 weeks ago that she needed a nebulizer. That was rough! Up every hour at night! Anyways, she seems to be better now, and did go through a growth spurt, it seems, for a few days after being sick. Now, she wakes every nap within 45 minutes to an hour. during the growth spurt, she ate almost a full feeding. Now, though, I think it's just the 45 minute intruder. did you let your babies CIO at this young age? We did it with my son when he was 5 months i think. The other thing is that he is 3 and we just don't let her cry much during afternoon nap or night in fear of waking him. I know it needs to happen though. What are your thoughts? I read your blog all the time with my son. it's great! I'm just feeling a littel out of control and sorts with my daughter. help! how long is her last nap?